The Honest Dietitian: The FODMAP Diet for IBS, etc. The FODMAP Diet for IBS, etc. There are lots of people out there who suffer from Irritable Bowel Syndrome with either diarrhea, constipation, or a combination of both. There are some medications that can alleviate symptoms, however, there are no medications that can specifically treat the painful bloating that some people experience. I know many, many people who can bloat out to the size of a 5-6 month pregnant female after meals and even through allergy testing, upper endoscopies, colonoscopies, various medications and digestive enzymes, nothing seems to help discover the root cause to the discomfort. I've been watching the progression of interest in the FODMAP diet in the USA for some time now. 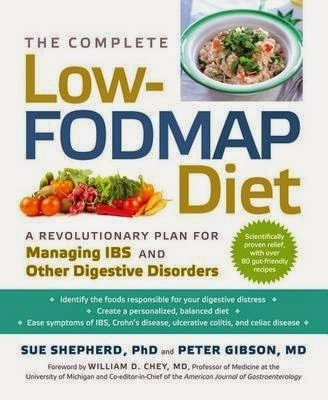 Dr. Sue Shepard and Dr. Peter Gibson created the FODMAP Diet in the 2000's and for many people, it has brought much comfort. So what is a FODMAP? Now, the point of the FODMAP diet is to eliminate FODMAPs from the diet for 6-8 weeks and then reintroduce the foods back into your diet to determine which foods may trigger symptoms. There are many resources on this diet, including Grocery Shopping Lists that make giving this dietary change a shot- a little bit easier. My husband and I went FODMAP free for an entire week this year and we both had a major decrease in our unattractive GI discomforts. In fact, the only reason why I didn't make it longer than a week with being completely FODMAP free is because I found it very, very difficult to comply on the road. I would love to see someone develop a really good "FODMAP Guide to Eating Out". And today, after eating a FODMAP filled lunch, I am really looking forward to giving it another shot. I also have some great recipes that my husband and I experimented with during our FODMAP free week that I will post.